Bride (looking at organ console): Ooh, isn’t it complicated! Groom: ‘Diapason’? I thought that was American for a baby’s nappy. Bride: How on earth do you know what to do with all these things with funny names? Me (modestly): Oh well, it isn’t too bad once you get used to it. OK, maybe I was basking in a bit of jargon-glory, and implying by my demeanour that playing ‘Here comes the bride’ is a skill which needs years of study at some conservatoire added to a high degree of natural musical ability. You have to do this with brides sometimes to get any sort of respect. But what I said was actually true. 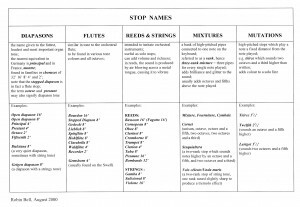 Once you get used to what the names and numbers on the stops mean, you know what they should sound like, both in isolation and combined. And when you’re investigating a new electronic organ with a view to buying it, this is information you need. More on this in another post. But in the meantime, the following chart of stop ‘families’ is worth having a look at. Compiled by Robin Bell for a SCOTS* training day in 2000, it has been in use ever since, and Robin has kindly given permission for me to include it here. Click once on the image to enlarge it, then right-click to save it to your computer for printing later if you wish. The chart of course refers to both pipe and electronic organs. 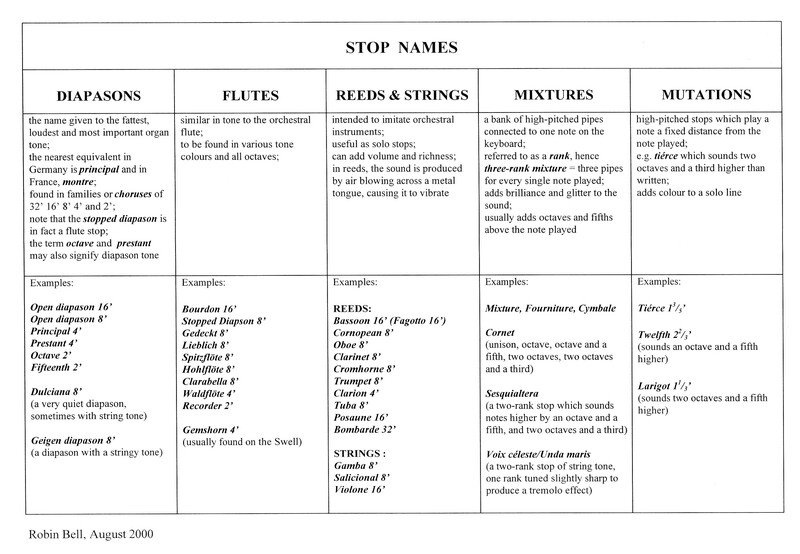 The next couple of posts dealing with stops will also refer to both kinds of organ, so I will leave out the ‘Electronic’ in the post title (I should have done it this time, really). But if you are thinking of buying an electronic and want to gather information, please read them.